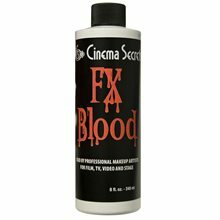 Blood Writer Spray Can.Includes: One Blood Write Spray Can.Create the perfect crime scene or complete a spooky haunted house with this spray-on theatrical blood. You can even write a spooky message to sure to scare all of those cute little trick-or-treaters! 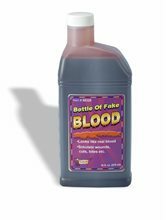 8oz Bottle of Gel Blood.Includes: One 8oz Bottle of Gel Blood.You have seen it by the bucketful in movies and on TV. 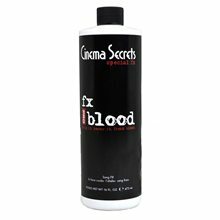 Now discover why Cinema Secrets Blood line is the blood of choice for so many. 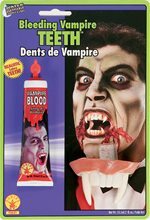 We offer three types of stage blood - FX Blood Blood Gel and nifty plastic test tubes of our specially formulated Mouth Blood. Nothing beats our Blood Gel for that dark clotting coagulated look. Eight ounce bottle. Liquid Blood Capsules.Includes: 6 Liquid Blood Capsules. *Costume and Accessories Not Included. Sold Separately. CAUTION!! : Do not use in eye area. Swallowing gel capsule not recommended. Do not use if package is broken or leaking.Liquid Blood Capsules comes in a packeage of 6 capsules. These are water washable. Extra Thick Blood.Includes: One 1oz (28g) tube of Blood. *Makeup, Costume and Accessories Not Included. Sold Separately.This Extra Thick Blood is water washable.CAUTION!! : Do not use blood in eye area.NOTE: Not recommended for children under 8 years of age. Adult supervision recommended. 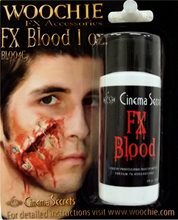 FX Fake Blood 16 Oz Gel.Includes: One 16oz bottle of FX Fake Blood.You have seen it by the bucketful in movies and on TV. 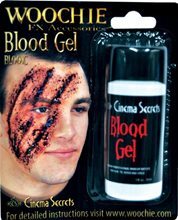 Now discover why Cinema Secrets Blood line is the blood of choice for so many. We offer three types of stage blood - FX Blood Blood Gel and nifty plastic test tubes of our specially formulated Mouth Blood. Nothing beats our Blood Gel for that dark clotting coagulated look. 16 ounce bottle. Great tasting theatrical blood! Cinema Secrets is the best in the business.